Tag Archives for " Google Ads "
If you want to run a business today, you need to be advertising on Facebook and Google. These two tech giants dominate the online advertising market, and their reach is so incredibly broad (both have billions of users each month) that to leave them out of your strategy is to not have an online strategy at all. However, if you take a look into how to approach advertising on these sites, you’ll find some conflicting opinions online. And of course the advertising approach for a large company is going to be very different from the one undertaken by a small business with a limited marketing budget. Here, we’ll look at how to make Facebook and Google work best for you, the small business owner. Before you go off down the marketing rabbit hole, the first thing you need to do is set a realistic budget for yourself. It’s entirely possible to run an effective marketing campaign online with an outrageous spend, but you’ll need to understand what you’re willing and able to spend before you can develop an approach to using these tools effectively. When you’re thinking about budget, it’s critical that you consider the budget for the year, not just month to month. Your online marketing campaign will not be successful if it comes in fits and starts—as one of our guest bloggers noted here, being a consistent presence online and in front of customers is a key component of building trust and driving conversions. That means that when you think about marketing budget, you need to think about your long game. After you’ve determined what you’re willing and able to spend, you’ll also want to set really clear objectives for your marketing campaign. Sure, you’re hoping to win more business, but how do you measure success? Number of conversions? Number of sales? Percentage of revenue growth? Understanding what your expectations are for your marketing efforts will allow you to better understand the results of your campaign and refine your approach further in the future. Each small business is solving a unique problem, and therefore has their own unique cohort of prospective customers that could benefit from their good or service. One of the key benefits to using Google and Facebook advertising is that they allow you to get really specific about the people who will see your advertising. I go into greater detail on this podcast about setting up your Facebook Business Manager account, but once you have that up and running there are a number of tools you’ll want to take advantage of to identify your most promising prospects. Facebook Pixel is a line of code that you can install on your own company’s website. This code will allow you to track those who visit your site and send them targeted ads on Facebook based on their behavior. If someone’s already expressed interest in your business by visiting your website but hasn’t yet become a customer, you’ll want them to encounter you again on Facebook. The more consistently someone sees your brand across various channels, the more likely they’ll be to go and check you out in greater depth. Creating lookalike audiences is another key component to optimizing your Facebook advertising. Facebook allows you to upload a list of your current customers, and then they generate a list of users who have similar attributes to those with whom you already do business. Google also provides business owners with a number of avenues to target specific users with their advertising. Google Ads (formerly AdWords) allows you to target your ads by location and search words. There is some legwork you need to do up front to research the most effective keywords for your business. Putting in the time at the start to do the research phase correctly can result in really stellar results for your business and will get you the most bang for your advertising buck. 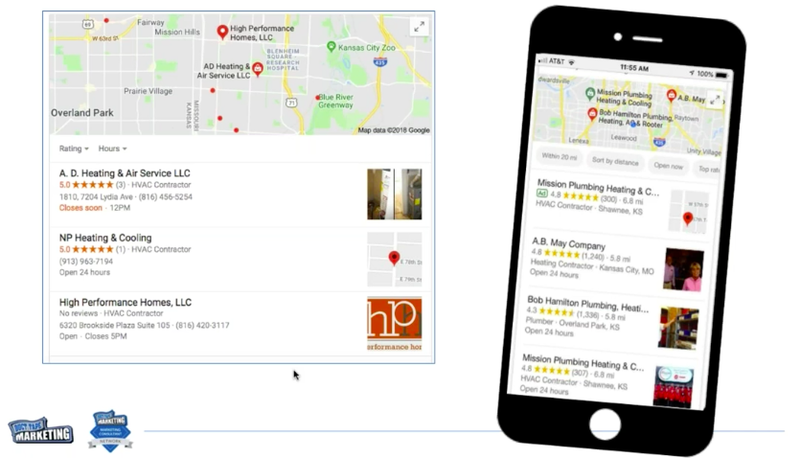 Google Local Services Ads are an important tool for tradesmen, technicians, or those who offer services to homeowners. Local Services Ads curates a list of providers of a particular service in a particular area (i.e. “electricians in San Francisco”). This puts your business front and center with those homeowners who are in immediate need of the service you provide. Your contact information is available, and so it’s a direct way to not only generate a lead but gain a new customer right on the spot. Facebook and Google both allow you to target your most promising prospects and to get detailed analytics about the success of your campaign, but there are some differences between advertising on the two sites, and so your approach to each should be unique. Facebook’s ethos is all about creating community, so when someone searches for a business there, the first thing they see is how their friends are interacting with the brand. Once they head to the business’s page, they’re encouraged to invite their friends to “like” the page. The advertising is visually-driven, allowing you to paint a picture (literally) of what your business can do. The endorsements of friends and other Facebook users and the image-rich pages all allow you to present your business as one that’s trustworthy—you’ve earned the kudos of real people and you’re not afraid to share pictures and videos that show who your company really is. Google’s paid search takes a different approach that’s more about immediacy. With a paid search ad, your company appears in line with results to a particular query. That means that if you’re a florist in San Diego, and someone is in desperate need of flowers in that geographical area, you can ensure you’re the first name they see when they type “florist near me” into their Google search. This allows you to become the immediate solution to their pressing issue. 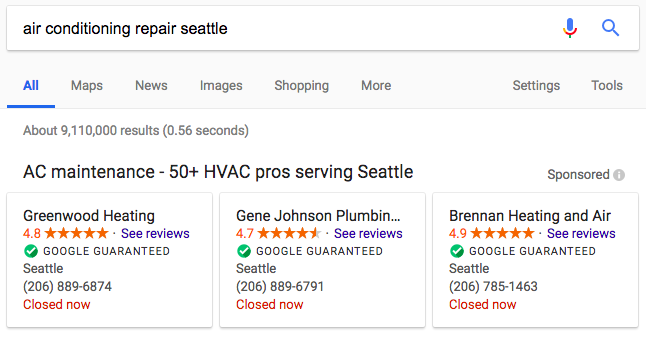 Google’s platform also incorporates ratings and reviews into some of its advertising (specifically as a part of Local Services Ads) and those with the highest ratings are often bumped up to the top of the results list. This means that reviews and trustworthiness are still a key component of the game on Google. While each platform has their own unique strengths, there is even more value in using the two together. Facebook cites a case study from the digital marketing technology firm Kenshoo, to illustrate this point. Kenshoo looked at Experian’s paid search approach and found that using Facebook and Google ads together helped to improve the overall effectiveness of their campaign. Because users often turn to Facebook first and go there for personal recommendations from friends and other users, having advertising present on Facebook is a valuable first step to gaining a prospect’s attention. As I’ve noted before, 90 percent of consumers say they trust a recommendation from a friend or family member, and 70 percent say they trust a personal recommendation from any fellow consumer (even a stranger online). In their case study, Kenshoo noted that when Experian advertised on both Facebook and Google, they saw a 19 percent increase in total conversions, while spending 10 percent less overall per acquisition. Using both platforms together allows you to get in front of prospects across multiple channels, build trust, and make the conversion. Both Google and Facebook ads provide you with a lot of information about how your ads are performing. Do you have an ad that’s reaching the right people but isn’t resulting in leads or conversions? If you’ve put together an expensive television ad or print campaign that isn’t generating results, you’ve already spent the money and can’t take it all back. Fortunately, with online advertising you’re able to quickly scrap ideas that aren’t successful and test out new approaches. And if you make tweaks to your advertising one step at a time, applying the principle of A/B testing, you’re able to see what change you’ve made that’s generating the most positive results from your audience. From there, you can hone in on that approach and expand it to other marketing and advertising efforts. Facebook and Google ads are really great for small businesses because they’re a low risk and potentially high reward way to reach new customers. Both platforms make it easy to find those who are most likely to want to interact with your brand, which makes lead generation and conversion an easier task. And if you’re willing to go the extra mile and sort through the analytics that come back from your campaigns, you can use that information to further refine your approach in the future, thereby creating more and more effective advertising campaigns each time. If you liked this post, check out our Small Business Guide to Advertising. The video above is a replay of a recent live webinar I conducted. Combined with the text below you should have a pretty good feel for how to use Google for small businesses. These are all great tools to help you grow your small business, so I thought I’d dive into each of them to give you a better understanding of how to use them and how they can benefit you. This tool is critical for local businesses. This is one of the top ways, if not the way, businesses are getting found in their local community, which is why I spend so much time talking and writing about this topic. In addition to the tactics above, there are some things you can do on an ongoing basis to increase your chances of being found in the 3-Pack. Respond to all reviews (both positive and negative) – Be sure to turn on notifications so that you are alerted when a new review has been posted so that you can respond promptly. Use Google Posts – This is one of the newer features within the Google My Business listing and typically speaking, if Google really starts to pay attention to something, I’d recommend you spend time on it as well as it could imply that it will influence search rankings. This is one of those things. 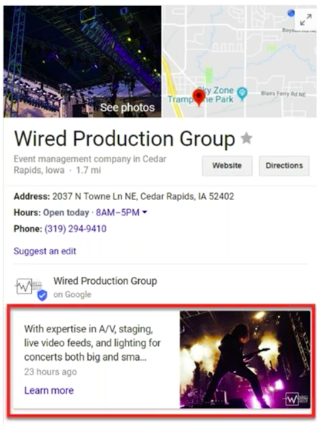 This new feature allows you to essentially showcase mini blog posts within the Google My Business listing that can be educational or promotional. It’s another area to really showcase your business. Another thing to check frequently is making sure nobody is suggesting inaccurate edits to your listing, which people have the ability to do by clicking the Suggest an Edit feature in the public listing. 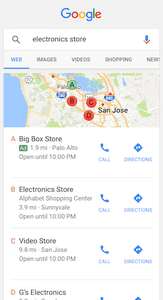 With the new messaging feature on mobile devices, people can actually text you now from the Google My Business listing (your number will never show publicly). This can be a great tool for businesses who are appointment-focused or need to respond to messages quickly. You have the ability to set up your website as a tracking URL (UTM code) in the edit screen of your listing (it will still show as your URL when it’s public-facing). This allows you to clearly see where your marketing efforts are having an impact, where people are coming from, and so on. If you don’t create a tracking URL, and just put in your web address, all of that traffic in Google Analytics will say it came from Direct traffic and won’t segment out that it was from your listing, which I think is important information to have. By adding the UTM code, it will filter under the Organic traffic bucket, which is where it really belongs. This is another free tool that has actually been around for a while (formerly Webmaster Tools) and is one of the most important tools for you to use for your SEO efforts. Google has spent a lot of time in recent years to improve it which to me, is a sign it’s not going away anytime soon and is a significant tool for you to use. This tool is your best source of data about where your traffic is coming from, how pages are ranking, and what people are searching for that actually lead them to your website (we used to be able to get that information in Google Analytics but are no longer able to). They are currently in the process of releasing a new version of the tool, so right now you’ll spend a bit of time going back and forth between the old version and new, which isn’t a huge deal with how it’s set up, but it’s something to be aware of. Check your messages – This is where Google will communicate with you about your website and any issues you’re experiencing (it may take a couple of days for the messages to populate). Google will actually be able to point out page crawl errors, HTML improvements, penalties, and if you’ve been hacked. It will also tell you how to fix all of these issues. Integrate Google Search Console with Google Analytics (this will help you track goals and conversions). 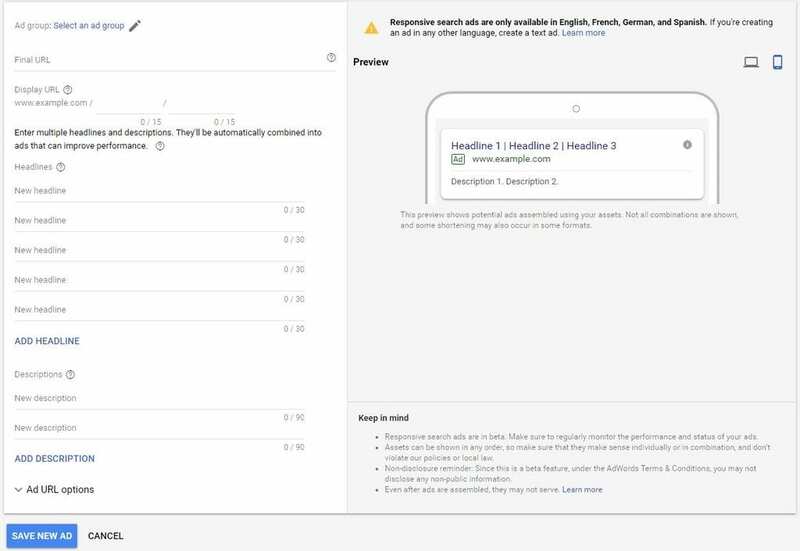 In Google Analytics, click Admin and then Property settings, you’ll see Search Console and it will give you the ability to add a Search Console. Wait a few days (depending on your site, it may take some time for Google to crawl your site and gather the information needed). The screenshot above is located in Google Analytics. Click Admin and scroll over to Property, where you’ll see AdWords linking (you can do this from Google Ads as well). I recommend integrating these tools because you want to know where your traffic is coming from and if it’s converting. It’s a great way to track your goals and get granular with your marketing. As a side note, see where it makes sense because it’ll be an easy way to spend all of your money at once. Google does A/B testing for you and you’re able to input up to 15 headlines, 300 characters and 4 descriptions in the pool where they’ll mix up all the combinations (including extensions) and test on your behalf (leading to roughly 40K+ possible combinations) so that you know the ads give you the greatest opportunity for click-through rates. These ads will essentially take over page one of Google (which is great for advertisers) and is something marketers should pay attention to. This feature has been around for awhile but it is something that has been expanding rapidly. It is focused on a handful of home service businesses and if you’re one of these businesses, you need to be paying attention to these placements because they are dominating page one. Reviews, proximity, responsiveness and how well your ad profile is optimized will contribute to your prominence in this space. These ads are set up as cost per lead based on search term. You have the ability to do search term and geotargeting. Google My Business is a must for local businesses. Google Search Console provides the best SEO data. It’s important to connect Google Ads, Google Analytics, and Google Search Console. You must pay attention to ads. There you have it! Have you started to explore these areas of Google? If not, I highly recommend doing so. Need more tips on search engine optimization? Check out our entire Guide to SEO. Need a proven small business marketing speaker for your next workshop, conference or event?